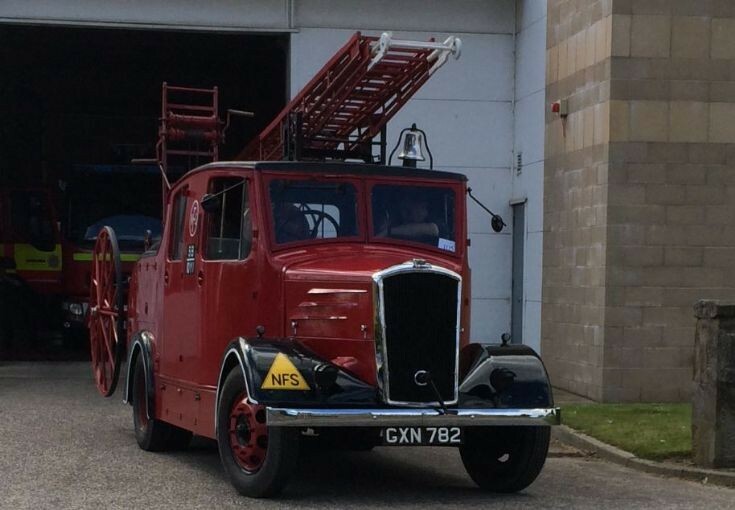 Taken on 13th August outside the new fire Station when attending local vintage vehicle rally. Originally Stationed at Elgin Marywell stables (NFS) then temporary accommodation (hydro board). In 1953 at the new station in Haugh road, Fraserburgh and latterly Gordounstoun school. See In-service Haugh road and Hydro board pictures on this site courtesy of Andy Bain. What happened to its headlights? Added by Rob Johnson on 15 September 2017. They've got wartime blackout covers on them !! Added by Rick Loudon on 04 October 2017. Added by Rob Johnson on 05 October 2017. Added by Rick Loudon on 09 October 2017. Hi Rob, yep, would look a lot nicer with a pair of 8" headlights but was keeping to the original spec. Normal lenses carried as well in case some light is needed. The bell should be painted black but that was too much! Added by Peter McCombie on 10 October 2017. I sincerely hope the tyres are not "preserved" too - driving around in the dark is bad enough, but not on seventy year old rubber! Added by Rob Johnson on 11 October 2017. Added by Peter mcCombie on 09 April 2019. Is there such a thing as a tire museum?